Chicory has a long and well-documented history of assisting with liver problems and body cleansing. It also assists in blood cleansing as well as controlling blood sugar levels in the blood. This herbal remedy is highly recommended and beneficial for those who suffer from type 2 diabetes. In addition, Chicory Root can be used to reduce the risk of kidney stones, gallstones, jaundice and other diseases of the liver. The benefits of Chicory Root extract also include anti-inflammatory properties which may help to relieve the joint pain caused by arthritis and headaches. Being a great source of vitamin A, Chicory root tincture has positive effects on our vision and the function of our nervous system. Chicory root has diuretic and laxative properties and has been used to treat constipation and gout. Studies show that Chicory may increase the feeling of fullness to avoid overeating and it will also help to counteract stomach acid after eating too much rich food. It contains vitamin C, a powerful antioxidant and is currently being studied for its potential ability to prevent colon cancer. The extract of Chicory Root has been used by herbalists to aid in decreasing the levels of serum LDL cholesterol in the blood. Chicory root contains the highest concentrations of inulin, and this friendly flora helps to improve the overall digestive function of the body. Because of its potential for removing contaminants from the digestive system, the liver does not have to work so hard to filter out toxins that may have escaped into the bloodstream. The high vitamin C, a powerful antioxidant, is known for its ability to help prevent jaundice, enlarged liver, and other liver diseases. This is a valuable herbal supplement for anyone seeking to achieve optimal liver and gallbladder health. The compounds found in Chicory reduce hunger but stimulate the sensation of fullness while supporting the breakdown of fats in the body. Recent studies have produced some very positive evidence that Chicory Root fights fat and benefits weight loss because of the effect on the digestive system. It also supports the body's detoxification system through the liver and kidneys and is believed to help with calcium absorption. Proper digestive functioning is crucial for weight loss and proper digestion. Acting as an herbal antacid, the root is said to neutralize the stomach acid and correct acid indigestion, heartburn, gastritis, vomiting, upset stomach and lack of appetite. It's detoxifying, cholagogue, anticatarrhal and alkalizing effects are effective in treating hepatitis, mild enterocolitis, intestinal worms, carbuncles, acne, and hemorrhoids. Chicory Root contains many minerals and vitamin A, C, K, B, and P, and is one of the most powerful antioxidants and a high source of inulin. This means the root can have a lot of benefits in the body, including strengthening the body's immune system to fight infections and illnesses. Various studies have shown that inulin greatly reduces the risk of intestinal cancer. 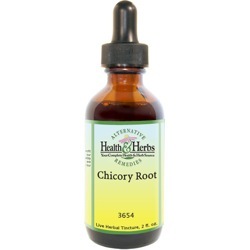 Chicory Root contains a substance known as oligofructose-enriched inulin. According to UMCC, the compound encourages the proliferation of healthy disease-fighting bacteria in the gut. Taking Chicory Root extract is beneficial because it helps with constipation, balances the bacteria in your colon and cuts down on the levels of serum LDL cholesterol in the blood. Recent studies show promise for this herbal supplement in the area of good heart health by fighting fat and helping to decrease blood cholesterol levels, as well as controlling rapid heartbeat, or arrhythmias. Those with a very high-fat diet experienced a remarkable decrease in blood cholesterol levels in time after taking Chicory Root, which may prove very helpful in cases of hardening of the arteries. There have been several cases where Chicory Root extract has been used successfully for thrombosis, a condition in which clots are formed within blood vessels. Chicory is a herb that is filled with plant phenolics possesses anti-inflammatory and anti-thrombotic qualities. The anti-inflammatory properties of Chicory Root make it an effective remedy for joint problems like osteoarthritis, arthritis, and rheumatism. It has been shown that the consumption of Chicory extracts may also act as a sedative and anti-inflammatory for the nervous system. For those with nervous system disorders, Chicory can reduce inflammation and ease nerve pain. For those who do not suffer from nervous system disorders, Chicory can help to prevent the development of these disorders. Chicory Root has been used as a tonic that nourishes and strengthens kidney function and urinary organs. The herb has a diuretic action that increases and promotes the flow of urine, which helps to improve kidney function by cleansing the kidneys of toxins and removing them from the body. It has been used to expel gravel, calcium deposits, and excess uric acid from the body, which helps to prevent gout and kidney stones. Chicory has special properties that may make it a good option for women. The Chicory root has abortive properties that can be very useful as a natural contraceptive. This is also the reason that this herb should be avoided if you are pregnant or seeking to become pregnant as it can cause a miscarriage. Women who suffer from premenstrual syndrome (PMS) often find that chicory helps alleviate painful symptoms. Studies have shown that it assists in maintaining hormone balance and lessens the symptoms associated with PMS. It has also shown to help with irregular periods and to discourage the growth of yeast infections. Studies show Chicory aids in the body's ability to absorb calcium, a nutrient that helps build and maintain strong bones and teeth. Used externally, Chicory Root is believed to have healing properties for skin lacerations, swellings, hemorrhoids, poison ivy, and sunburn. In addition, it has been used in poultices to reduce the inflammation of rheumatism and the pain of stiff and sore joints. Ingredients: Chicory Root, Structured Water, 20% Alcohol. Non-Alcohol: Chicory Root, Structured Water, Vegetable Glycerin. Contraindications: Pregnant and nursing women should not use Chicory Root. A minor side effect may be skin irritation. From Tammy Hauptman of DeKalb, Illinois on 2/13/2015 . From Anonymous of Toronto, Ontario on 8/24/2014 . From Gloria Charon of Lyons, Illinois on 2/25/2013 .